Sophie* is a 15-year-old cross country runner who has a history of a foot stress fracture and shin splints. She often does not eat prior to her workouts. Recently, she has felt fatigued and weak during her races, saying her legs feel heavy and she sometimes feels dizzy. She has been running every day, averaging 40 to 50 miles a week, and has lost 18 pounds in the past year. At times she feels running has become a compulsion. She previously had normal periods but has not menstruated in 5 months. Her tests showed low bone mineral density and low iron and vitamin D levels. Maintaining a healthy level of activity through sports and exercise is important for girls and women of all ages. But if an athlete becomes overly focused on dieting and exercise it can have a negative effect on sports performance and overall health. "The Female Athlete Triad is a medical condition often observed in active girls and women," said Dr. Cynthia Labella of Ann and Robert H. Lurie Children's Hospital in Chicago, Illinois. "It can involve low energy (calorie) availability, menstrual dysfunction, and low bone mineral density. Early identification and intervention is essential for preventing the Triad from progressing to serious conditions such as clinical eating disorders, amenorrhea, and osteoporosis." Athletes in certain sports, including those that stress a thin appearance, such as figure skating and gymnastics, and those in which being thin is thought to improve performance, such as distance running or rowing, are at higher risk. Low energy availability can result from disordered eating, such as those who starve themselves (anorexia nervosa) or others who alternate between overeating and purging (bulimia). An athlete without enough calorie availability can develop problems such as dehydration, muscle fatigue, and erratic heartbeat. Inadequate nutrition can also lead to bone loss. Having low bone mineral density leads to higher risk for fractures and injuries, which can prevent sports participation. A normal menstrual cycle is also important for bone health because the body produces estrogen during menstruation which helps to keep bones strong. 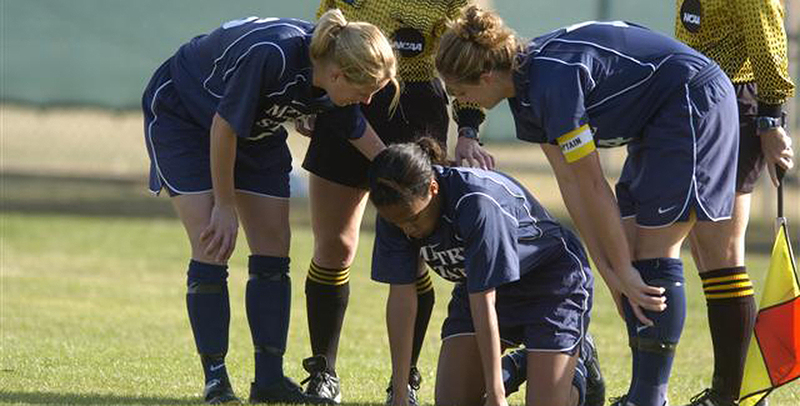 Recognizing the female athlete triad is the first step in treatment. Successful treatment of female athlete triad relies on a team approach, which may include your pediatrician, gynecologist, coach, athletic trainer, nutritionist, and psychological counselor. "Education about healthy behaviors and optimizing bone mass is necessary to restore regular physical activity and sports participation," said Vineeta T. Swaroop, MD, Assistant Professor, Northwestern University Feinberg School of Medicine. "Exercise is vital for women of all ages to build and maintain healthy bones. When the female athlete triad happens, young women can still win the battle by working with their families, coaches, and a healthcare team," said Ellen M. Raney, MD, FAAP, Affiliate Professor, Oregon Health Sciences University, Shriners Hospitals for Children, Portland, and chair, Pediatric Specialty Group of the US Bone and Joint Initiative. In Sophie's case, her treatment team included her family, doctors, physical therapist, dietician, and a psychologist. With a comprehensive treatment program, she began gaining weight slowly, her regular periods returned, and her iron and vitamin D levels returned to normal. Not only was Sophie able to resume running four days a week without further injuries, she even participated in cross country as a collegiate athlete. For more information about the adolescent female athlete triad, visit the website for the American Academy of Pediatrics, or Your Orthopaedic Connection. This story is brought to you as part of World Pediatric Bone and Joint (PB&J) Day, celebrated Oct. 19, which is part of Bone and Joint Health National Action Week (Oct. 12-20).